The story of how a discarded violin kindled the spark of love in an absent father for his abandoned daughter. Set in the eighteenth century, this one act play moves from the dusty workshop of violin maker, Bartolomeo Guarneri (Del Gesù), in Cremona, Italy, to teeming Drury Lane in London, where actor, singer, dancer and violinist, Richard Charke plans his escape from his creditors and sets off for the promise of a new life in Jamaica. On his voyage to the West Indies, Charke discovers the potential of a cast-off violin made by Guarneri, and given to his fellow violinist, Creponi, in exchange for his sister's virtue. Charke cheats the drunken Creponi of his flawed instrument, and sets off a chain of events that lead Charke to rediscover his feelings of love, not only for music and the violin, but for the baby daughter he abandoned in London. 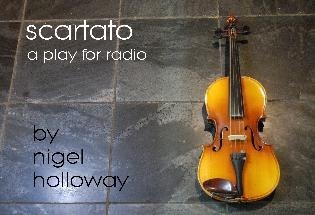 The audio version of Scartato is now available! If you want to download the audio version of this play, click here. Scartato is published by Production Scripts. Go directly to the script details here. Scartato, the novel, is available from Amazon Kindle.